Introduction: Several studies have been conducted to find new biomarkers for the discrimination of Latent Tuberculosis Infection (LTBI) from active TB (ATB); however, their findings are inconsistent. The aim of the current study was to evaluate the potential of in vitro antigenspecific expression of Monocyte Chemotactic Protein (MCP)-2 for discrimination of ATB and LTBI after stimulation of whole blood with PE35 and PPE68 recombinant proteins. 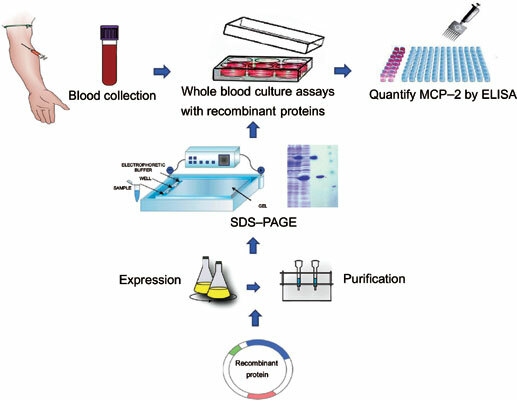 Materials and Methods: The recombinant PE35 and PPE68 proteins were evaluated at a final concentration of 5 µg/ml by a 3-day whole blood assay. Secreted MCP-2 from the culture supernatants were measured by commercially available Human MCP2 ELISA Kit. The diagnostic performance of MCP-2 was ascertained by Receiver Operator Characteristic (ROC) curve and measuring the Area Under the Curve (AUC) and their 95% confidence intervals (CI). Cut-offs was estimated at various sensitivities and specificities and at the maximum Youden’s index (YI), i.e. sensitivity specificity–1. Results: The median MCP-2 response to both PE35 and PPE68 in those with LTBI was significantly higher than patients with ATB. The discrimination performance of MCP-2 response following stimulation of PE35 (assessed by AUC) between LTBI and patients with ATB was 0.98 (95%CI: 0.94-1.00). Maximum discrimination was reached at a cut-off of 86pg/mL with 100% sensitivity and 97% specificity. The highest sensitivity and specificity was obtained using cut off 58 pg/mL following stimulation with PPE68 (100% and 90%, respectively; AUC: 0.94, 95%CI: 0.85- 1.00). Conclusion: MCP-2 induced by PE35 and PPE68 shows good discriminatory power for discrimination of ATB and LTBI. Additional studies with a larger sample size are needed to confirm the advantage of this marker, alone or combined with other markers; however, these findings present a promising method, which can discriminate between ATB and LTBI. MCP-2, PE35, PPE68, active tuberculosis, latent tuberculosis, monocyte chemotactic protein.